Characteristics of Han Visual Arts and Culture. The dynamic Han Dynasty (206 BCE  220 CE) witnessed a significant revival in Chinese art, compared to the preceding era of Qin Dynasty art (221-206 BCE). Chinese pottery (notably ceramic figurines), jade carving (notably jade suits), silk weaving and Chinese painting (on paper) were three areas of particular achievement. It is believed, for instance, that the earliest examples of Chinese porcelain was produced in the province of Zhejiang during the late Eastern Han (100-200 CE). Founded by Emperor Gaozu, the Han Dynasty divides into two periods: the Western Han (206 BCE  9 CE), with its capital at Changan (second only to Rome as the largest city in the ancient world), in present-day Shaanxi Province; and the Eastern Han (25220 CE) whose capital was further east at Luoyang (the headquarters of the ancient Zhou Dynasty), in present-day Henan Province. A progressive period of Chinese history, the Han Dynasty was responsible for numerous technological and scientific achievements, including water clocks, sundials, astronomical instruments, and the development of paper. Ideologically, it was greatly influenced by the ethics and philosophy of Confucianism, although traces of Legalism and Daoism from the earlier Zhou Dynasty remained. Under Emperor Wudi (14186 BCE), China regained control of lands first conquered by Emperor Qin Shihuang, including parts of southern China and northern Vietnam. In addition, the subdugation of parts of central Asia in Tajikistan and Uzbekistan gave Han emperors control of important trade routes to Europe, and thus outlets for its silks and gold. By 166 CE, a direct link to Rome had been established, resulting in imports of ivory and tortoiseshell. For more about the principles of visual arts in ancient China, see: Traditional Chinese Art: Characteristics. The Han Dynasty presided over a golden age of Chinese culture, which embraced visual art as well as poetry, literature and music. In the case of both fine art and decorative art, a major stimulus was the revival of tomb art, which developed significantly during both the Western and Eastern Han eras. During the Western Han, for instance, deceased individuals were interred along with objects and works of art which they had used while they were alive. By the era of the Eastern Han, however, tombs tended to contain artifacts which were made exclusively for burial purposes. Such artifacts included miniature items of ceramic art - typically watchtowers and other examples of urban architecture - along with miniature models of farms, pigsties, and farmyard animals. Han artists and master craftsmen also decorated the brick walls that lined underground tombs with mural paintings and a range of carved relief sculpture, whose aim was to assist the deceased in their travels through the afterlife. The engraving or stamping of decorative motifs into tile and brick surfaces was also widely practiced. For more about the historical context of Han Dynasty arts and crafts, see: Chinese Art Timeline (18,000 BCE - present). Han tombs and graves also contained a wide variety of figurative terracotta sculpture, known as ming-chi or yong. This was because, in the afterlife, the Chinese wanted to surround themselves with representations of people who had given them particular pleasure during their life. Thus human figurines were included so as to perform various functions for the deceased, such as dancing and playing music. A popular example of this type of ceramic statuette was a female dancer with long, silk sleeves. Typically, these figurines were painted or coated with a lead glaze. Many other different types of art can be found in Han tombs, including decorative works like red-and-black Chinese lacquerware - including lacquered coffins. Silk weaving was also well advanced, and - as seen in tomb banners and costumes - Han silk weavers were famous not just for their plain silk, but also their silk gauze, damask and brocade, and embroidery. A more unusual artform consisted of bi or pi discs, small thin items made from jade or metal, each with a central hole. These discs, which were usually placed near the body of the deceased person, were supposed to guide the person's spirit to heaven via the Pole Star, represented by the hole in the centre. Derived from Chinese Neolithic art, these discs were also incorporated into larger artifacts, such as furniture handles or mirror stands. Other products of Han metalwork and jewellery art included tomb ornaments and personal items fashioned from opal, amber, quartz, gold, and silver. Ivory carving was another prized skill: one that was kept well supplied by imports of elephant tusks and rhinoceros horn. Jade carving and craftsmanship during the Han period was the product of centuries of goldsmithing and jade cutting. In China, ever since ancient times, jade was believed to contain cosmic energy and possess mystical, life-giving qualities. During the Han era, the mineral became increasingly revered not only as a mystical, beautiful stone but also as a precious stone that embodied purity and virtue. Jade carving was complex and time-consuming, and jade objects were both rare and costly. Moreover, only certain people were permitted to wear jade jewellery: only the king wore the gui jades known as zhen, while only the nobility were allowed to wear the lesser jade tones known as huan, xin, gong, gu and pu. Perhaps the most remarkable example of jade art of the Han Dynasty were the custom-made jade suits designed to enclose the bodies of wealthy deceased aristocrats and protect them against evil spirits in the afterlife. Archeologists have unearthed a number of these remarkable jade ensembles, including those for Prince Liu Shen and his wife Princess Dou Wan, found in separate tombs at Mancheng in Hebei. Each suit was fashioned from over 2,000 jade plaques sewn together with as much as 24 ounces (700g) of gold thread, and each suited body was surrounded by up to 10,000 objets d'art. Another even more luxurious jade suit, made from more than 4,000 plaques, was discovered in the royal tomb of Zhao Mo, the king of Nanyue, near present-day Guangzhou. The tomb was filled with precious items including ritual bronze vessels, musical instruments, and incised elephant ivory, along with a pile of jewellery consisting of jade beads, necklaces and pendants. During the Han Dynasty, bronze sculpture reached new heights of complexity and sophistication, as in the beautiful bronze horses found in second century CE tombs at Kansu in the far north-west of China. Miniature bronze statues of men and women were also produced, as well as decorated mirrors, lamps and gilded bronzeware. The invention of paper about 100 CE triggered an upsurge of interest in calligraphy and its sister medium of fine art painting, as paper enhanced their ability to convey narrative as well as spiritual emotion. (It also led - it is said - to the invention of Origami paper-folding [known as "zhezhi" in China] during the Han era.) Han painting and drawing was also done on silk, lacquer or stone and tile, and in general reveals a lively style executed with a characteristic lightness of touch. 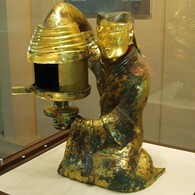 Note: For the influence of Han culture on the arts and crafts of Korea, see: Korean Art (c.3,000 BCE onwards). For other ancient cultures from central and eastern Asia, see: Japanese Art and India, Painting & Sculpture.  For more about the arts and culture of ancient China, see: Homepage.